Following the passage of the Affordable Care Act there has been a sharp rise in the number of retail clinics. Two basic reasons: More Insurance. Not Enough Doctors. Most hospitals and doctors’ offices are already stretched trying to meet the needs of their patients. Add another 30 million insured people to the mix who previously only sought medical services in an emergency room – and you get medical gridlock like rush hour in Los Angeles. Enter retail medical clinics with convenient and inexpensive preventative care services right where you pick up your prescriptions or shop for dinner. 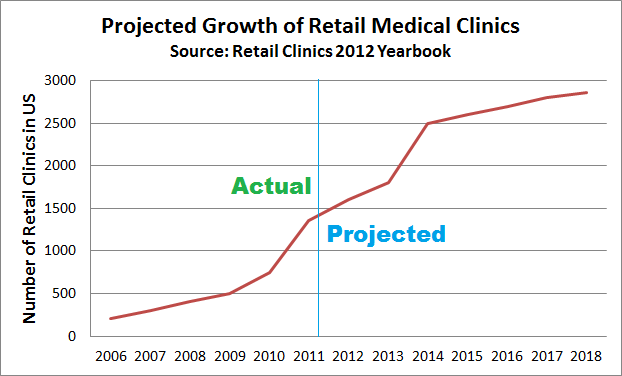 According to the Retail Clinics 2012 Yearbook, the number of retail clinics has grown from 202 in 2006 to 1,355 in 2011 and the number is expected to more than double to 2,854 by 2018. According to the Convenient Care Association, a national trade association established to create standards of care for retail clinics, “Convenient Care Clinics” have provided services to over 15 million people in the past decade. With health care costs on the rise, retail clinics are actually helping to control costs. Separate research studies conducted by Health Partners and by Blue Cross and Blue Shield of Minnesota both found that retail clinics can provide services at a fraction of the cost of physicians’ offices, urgent care clinics or emergency rooms. This is primarily because they are fine-tuned to provide a limited menu of services staffed by the most appropriate yet least expensive medical professionals for those services – nurse practitioners. The US is not only seeing more retail clinics but, more visits to clinics. According to the Rand Corporation, visits to retail clinics quadrupled between 2007 and 2009, with an estimated 5.97 million retail clinic visits in 2009 alone – and that was the year prior to passage of the ACA. This trend puts further pressure on the health care community to adopt and standardize Electronic Medical Records. It is already difficult to coordinate care between Primary Care Physicians and specialists; adding retail clinics to the mix further complicates coordination of care. Particularly for senior citizens who are some of the primary users of retail clinics. Parting thoughts for health care professionals: Your business is going retail one way or the other. Time to think about cost transparency, communication standards and the ever important customer experience.